Sections on universal ingredients - such as garlic, onion, and shallots - offer some of the simplest yet most satisfying recipes in the world. Consider the onion in these three marvelous incarnations: Lebanese Caramelized Onions, American Buttermilk Fried Onion Rings, and French Onion and Bacon Tart. And the chile section encourages readers to use real chiles (rather than reach for bottled hot sauce each time) on an everyday basis in recipes from Hungary to India, from Mexico to China, with wonderful results. Surprises abound in this vast recipe collection (over 60 percent of which are vegetarian or vegetable-based), such as Tanis's unexpected happy nod to the value of leftovers: he offers scores of suggestions to morph them into dishes every bit as delicious as the meal in which they originally appeared. "Our food editors recommend David Tanis Market Cooking as a new kitchen essential." "Tanis has long been one of the best voices on modern American cooking, a gifted chef--25 years at Chez Panisse--and equally gifted writer. His new book is a lovely one, with 200 recipes embedded in almost 500 pages, all geared toward today's vegetable-driven cuisine. . . . Tanis's food is deeply flavorful, honest, creative and always, always fun to cook." "A crash course on how to seek out the best, fresh, and simple ingredients, and what to do with them once you have them." "Deciding what to cook based on what looks good at the market only works if you have a roster of simple, accessible recipes for each ingredient at your fingertips. Luckily, that's exactly what the new book from [David Tanis] delivers here." "An inspired collection of ideas that serves as a teaching manual of sorts, with traditionally written recipes, ingredients and steps spelled out, and a more informal description in narrative form of how to prep a dish." "Tanis invites us to learn deeply about each ingredient and to discover cooking methods and recipes that showcase what makes them special. . . . With wisdom and generosity, Tanis eases us in the direction of more intuitive, more spontaneous cooking. The point of it all is this: Delicious needn't be complicated. And that's something that every cook--from beginner to pro--can appreciate." "A gentle, approachable guide to getting the most out of your [market] haul. . . . [Tanis's] calm, Jedi-like assurance guides you into making a perfect Tuscan pork roast, Oaxaca-style garlic soup, or a quick harissa recipe that you'll soon know by heart. There's a reason that young-gun chefs like Ignacio Mattos, who cooked with Tanis at Chez Panisse, revere him: He's got The Knowledge." "In [Tanis's] largest and most comprehensive cookbook to date, his words read as patient, funny, and understanding--the ideal companion on your seasonally focused culinary journey. . . . At a time when famous chef-driven cookbooks are becoming more and more like aspirational coffee table books--beautiful but full of eight-hour, six-component recipes you'll probably never work through--it's a delight to return to straightforward simplicity and accessibility. . . . In our restaurant-obsessed era, mixed in with Blue Apron conveniences, David Tanis Market Cooking makes a compelling case for staying home and cooking from scratch. "Over 200 confidence-building recipes. . . . Tanis is a wise chef for all seasons." "These beautifully simple preparations allow market-fresh vegetables and herbs to shine. . . . An inviting entry to the fundamentals of market cooking." "Recipes are simple but deliver. Tanis is an excellent recipe writer as well." "I could happily eat David's food every day. I love its beauty, simplicity, and integrity, and there's always an element of surprise. Market Cooking is his best book yet." "There is a refreshing clarity to David Tanis's food. Who needs fireworks when your ingredients are market-fresh, the recipes are reassuringly straightforward, and the author is the most brilliant cook?" "David Tanis always makes me want to cook--right now. This is a gorgeous and essential book." "I do not know how he does it, but David Tanis has produced another can't-do-without book--a classic." "David's cooking is succulent, fresh, and full of joy." 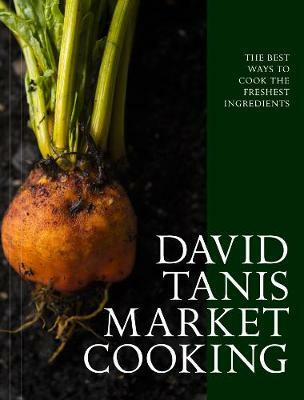 "In Market Cooking, David Tanis shares the genius of his nuanced, simple yet sophisticated dishes. His book is a must-read for home cooks and professional chefs alike." "A gem of a book--David's food is the perfect balance of wise traditions and contemporary whimsy." "I can't explain it! He makes magic with simple ingredients and with such ease. Tanis is a wizard!" "What joy . . . I love the purity and simplicity of David's food and his evocative prose."